An EPFL researcher has developed a system based on fuel cells to reduce the carbon footprint and energy consumption of cruise ships, which are increasingly popular among vacation goers around the world. 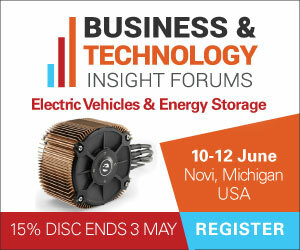 For more information see the IDTechEx report on Fuel Cell Vehicles. Spending a few weeks sailing the seas on a luxury liner is an idea that appeals to a growing number of people, particularly in Asian countries. But cruise ships do not just sail from port to port: as veritable floating hotels accommodating several hundred passengers, they use a great deal of energy for heating, electricity, air conditioning and various other aspects of life on board. To make them more environmentally friendly, Francesco Baldi, a researcher in EPFL's Industrial Process and Energy Systems Engineering Group (IPESE), has come up with a novel solution. "It's easier to reduce the energy consumption of a merchant ship, because almost all of the energy is used for propulsion, unlike a cruise ship, which has various energy demands," says Baldi. "My work focused on reducing CO2 emissions, initially by optimizing each of the ship's systems and the design of the boat itself, to improve efficiency." These first efforts produced a potential 6-10% reduction in CO2 emissions for a diesel-powered cruise ship. Although promising, this was not enough for Baldi, so he considered alternatives to diesel engines. In a collaborative project with Aalto University in Finland, he looked at using fuel cells on a ship. This required him to address the special challenges that arise when sailing for thousands of kilometers at a time. "You need to store enough energy on board without taking up too much space. Hydrogen fuel cells are not suitable, because storing enough energy to travel long distances would take up a huge amount of space - around one third of the ship's capacity - which is not realistic for a cruise ship," Baldi says. Although they need high temperatures to work and take up to 20 hours to turn on, solid oxide fuel cells (SOFC) turn out to be a good fit for ships. All that was needed was to find a use for the surplus energy resulting from having them in constant use, which is necessary given the long start-up times. This is where Baldi stepped in: his idea was to use a system developed at EPFL to transform unused energy into hydrogen, which is then stored. The resulting fuel cells, customized for ships, could thus generate either electricity to be consumed on board or hydrogen to be stored for later use. This concept is particularly well suited to cruise ships, according to Baldi. One of the advantages of fuel cells is that they only produce CO2 and water, unlike a Diesel engine which also produces other pollutants, such as nitrogen oxides and particulate matter. Fuel cell generate power though a chemical reaction. This makes them much more environmentally friendly than fossil fuels - and also more efficient: the fuel cells developed at EPFL have achieved 75% efficiency versus less than 50% for even the most efficient diesel engine. The only downside is that the fuel cells cost ten times as much to produce as a traditional engine. "But prices will fall if demand increases. Also, the long-term cost is only 20-30% higher than that of a traditional engine, and opting for this cleaner type of fuel will enhance the image of the ships' operators." In the absence of regulations in this area, Baldi also sees the potential for Europe, where most cruise liners are built, to take on part of the cost in order to incentivize equipping ships with fuel cells. "This approach, which works for solar panels, could help cruise ships sharply cut their pollution in the future," says Baldi.